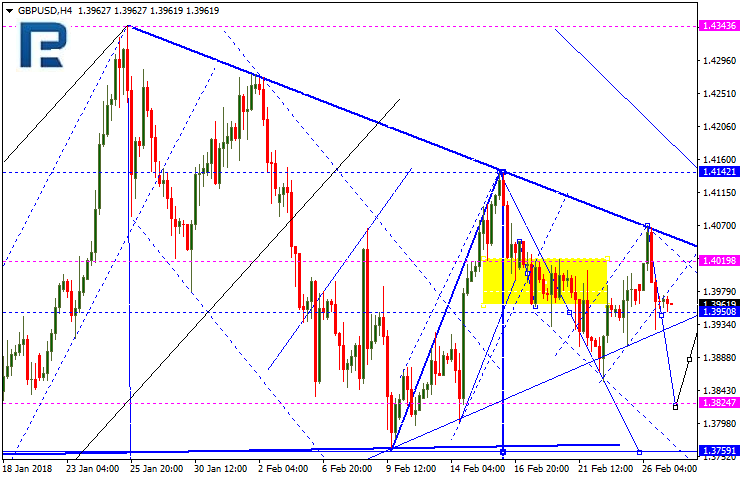 EURUSD is still consolidating without any particular direction. If later the instrument breaks this range to the downside, the market may continue trading to the downside with the target at 1.2200; if to the upside – start another growth to reach 1.2373 and then resume falling to break the above-mentioned target. 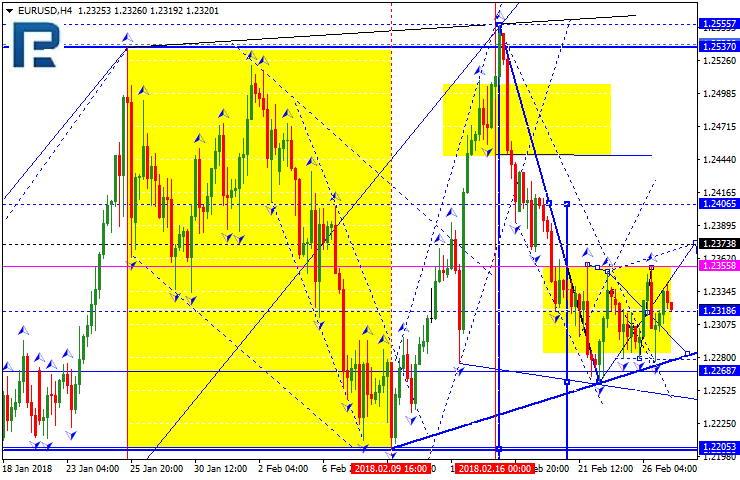 GBPUSD has completed another descending impulse and right now is consolidating. If later the instrument breaks this range to the downside, the market may continue falling inside the downtrend to reach 1.3760. 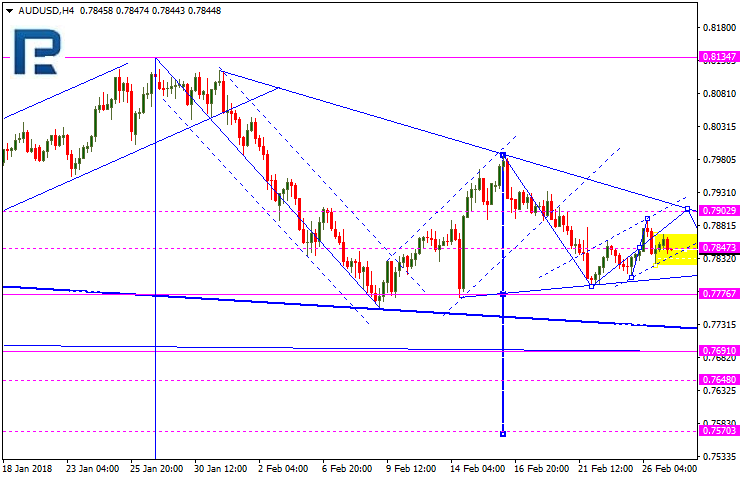 USDCHF has formed the ascending impulse and broken the consolidation range upwards. 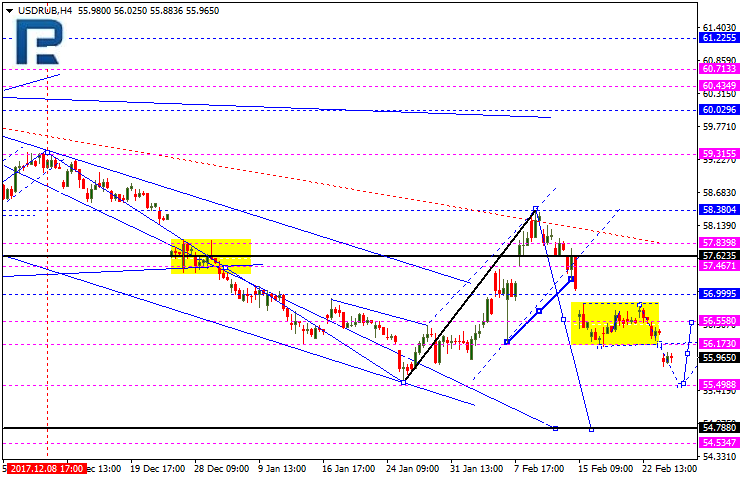 According to the main scenario, the price may reach the short-term target at 0.9555. 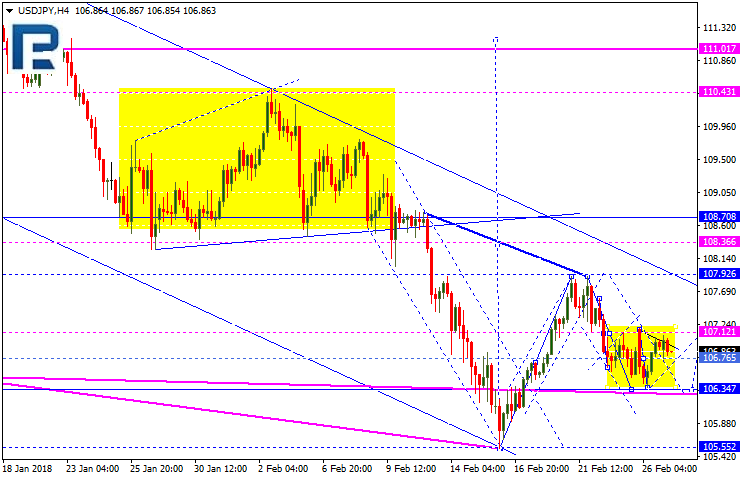 USDJPY is consolidating near the lows of the correctional wave. Possibly, the price may break the range upwards and finish the correction. Later, the market may start forming the third wave with the short-term target at 110.44. 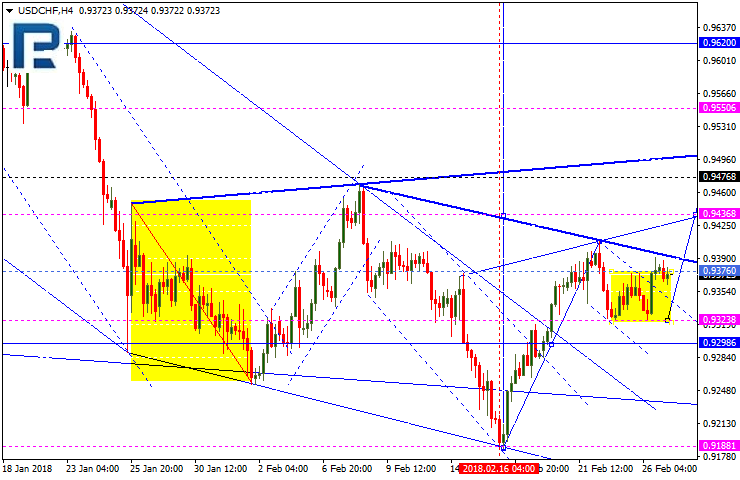 AUDUSD is consolidating. If later the instrument breaks this range to the downside, the market may fall to break 0.7777 and then continue trading to the downside towards 0.7648; if to the upside – start another growth to reach 0.7900 and then resume falling inside the downtrend. USDRUB has broken the consolidation range downwards and may continue falling. The target of the wave is at 54.80. Considering that there haven’t been any correction in this wave so far, the price may form another ascending structure towards 56.55 then resume trading to the downside. 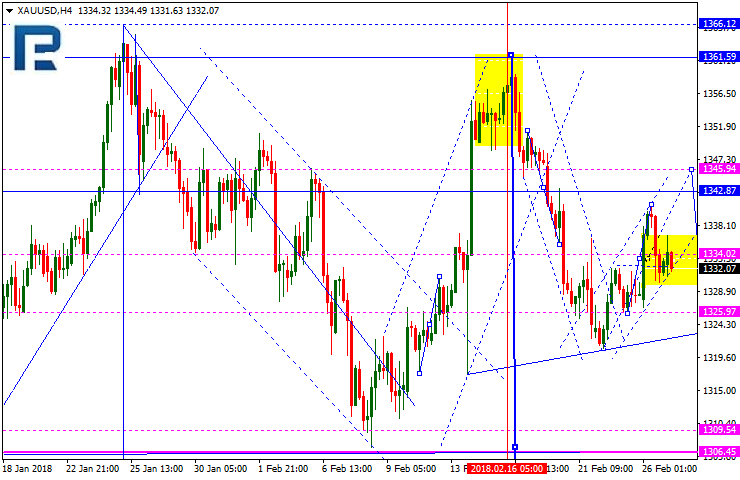 Gold has finished the descending impulse and right now is consolidating bear the lows of this impulse. If later the instrument breaks this range to the downside, the market may continue trading to the downside towards 1307.00; if to the upside – form another ascending structure to reach 1345.00 and then resume falling. 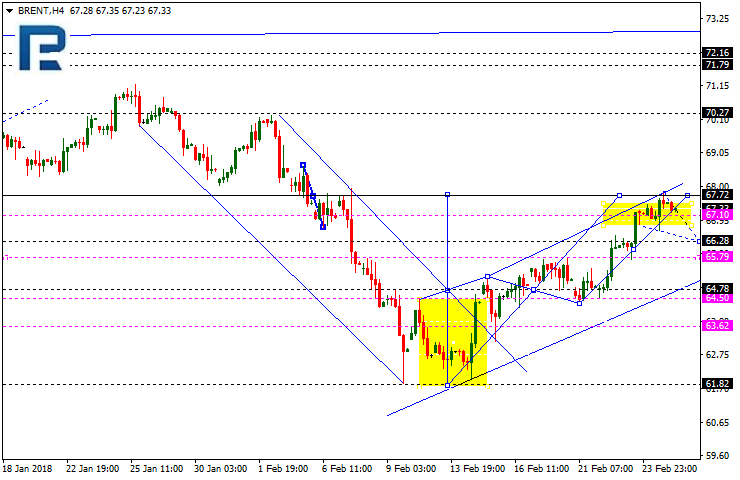 Brent has reached the upside target and right now is consolidating at the top of the structure. If later the instrument breaks this range to the upside, the market may continue trading upwards to reach 70.30; if to the downside – start another correction towards 64.80.